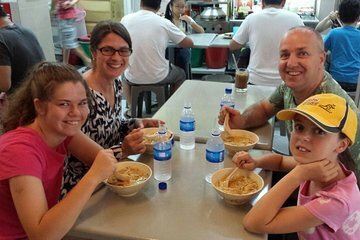 Great food, very interesting guide, a great way to see Singapore off the beaten track! Had to take a bit of a bus ride to get there but it was well worth the trip. Ended up have a personal guided tour of a non-commercial area of the city where the locals live. Got to try a lot of new and different foods -- including the dreaded Durian fruit. It is not as bad as they say it is! Got to see and learn more about how the local live, work, and eat. Well worth the experience. Just come hungry! We met at an Indian Coffee Shop in the Katong district where we had a traditional breakfast. Then walked around the district leaning about the area and the early settlers of Singapore. More food followed and a visit to an old home. More food followed, it certainly lived up to its name and we did not need to eat until much later in the day. This is a 'must do' tour - and make sure you go hungry as there is so much food to sample you'll be pleased it's a walking tour!! Our tour guide, Kathy, was friendly, very knowledgeable and had a great sense of humour. Having grown up in the area she was full of interesting tidbits which made the tour even more enjoyable. A highlight was the Peranekan house. An easy walk for all age groups.